Why not click HERE to see a pictorial potted history of the past 1000 years? What might our earlier mill have looked like? We are fortunate in having two maps (1807 and 1814) that agree very closely with each other, on which a reconstruction can be based (see above); also, there are mid-nineteenth century paintings of Moscar and Norton Hammer mills, showing low two storey buildings set into the slope of the ground, rather than our present ‘industrial revolution factory type’ building. Ecclesall mill is set further back from the river than the other mills on the Sheaf; this would have been so that they could take advantage of an existing drop in the land, which can still be seen on the right-hand side of the approach road to Tesco; our present main road runs along the top of this bank. The dam is fed from further upstream by a long goit – (a) above, much of which uses the top of the ridge as one bank – as does the top curved part of the dam, which would have needed excavating to a depth of at least four feet (b ) – map below: the water is prevented from flowing any further along the ridge by a fairly low stone wall (c) – map below; the water in the downhill part of the dam is held in place by an earth ramp, perhaps ten feet high; the whole structure has then to be lined with clay to retain the water. The lower part of the site, below the bank, contained the mill itself with two outhouses (at the bottom of the picture), while the miller’s house, at the top of the bank, was surrounded by a group of buildings, which look as if they belonged to a farm. The site stood at the crossroads formed by the Sheffield Baslow turnpike and Millhouses Lane, which ran right alongside some of the mill buildings, for there was, as then, no Archer Road. As can be seen from the map, the main road widened as it passed the mill, forming the equivalent of the traditional village green, so the buildings with its pond would have formed the focal point of the hamlet. 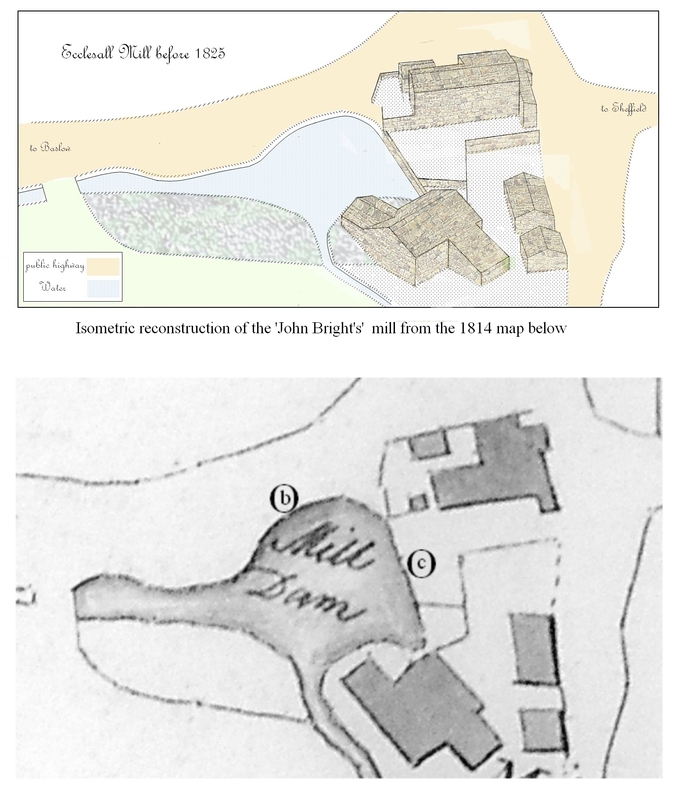 These two plans probably show us the mill as it was after John Bright’s restorations of 1680[i], as it remained in the tenure of one family – the Clarkes – during the whole of the 18th century and right up to 1821.